What were Canopic jars used for? Why were Mummy Organs put in Canopic jars? Ancient Egyptian Canopic Jars - Definition - What were Canopic jars used for? The Ancient Egyptian Canopic jars played an important role in the process and rituals associated with mummification, the creation of Mummies. Definition: Canopic jars were wide necked funerary jars designed to contain the large human organs called the *viscera which were extracted during the process of mummification. The heart was left in the body as the Ancient Egyptians believed the heart held the spirit, understanding and senses and would be needed on the Day of Judgement in the Underworld. *The viscera are the are the large inside organs of the body, such as the liver, lungs, stomach and intestines. The Purpose of Egyptian Canopic Jars - Why were Mummy Organs put in Canopic jars? Why were Mummy Organs put in Canopic jars? The Ancient Egyptians believed the dead person would need their organs for the afterlife and should be carefully stored and buried in the tomb of the corpse. The purpose of the Ancient Egyptian Canopic jars was to contain the liver, lungs, stomach and intestines which were removed during the process of mummification. Each organ had a separate canopic jar which were all stored together in a Canopic chest or box. The Ancient Egyptians believed that as the body was incomplete without these organs they were always placed and stored together in the Canopic chests. The stomach, liver, lungs and intestines were individually wrapped in linen. The linen packages were then put into the Canopic jars and resinous, consecrated oil was poured over them. The canopic jars were then ritally closed and conserved for "eternity". The liver, lungs, stomach and intestines were stored in their appropriate canopic jars decorated with depictions of the four sons of Horus. The canopic jars containing each of the four organs were identified with different gods who were the sons of Horus. The Ancient Egyptians sculpted the Canopic heads or stoppers of the jar to take the shape of the heads of the four sons of the god Horus. The Ancient Egyptian canopic heads therefore were depicted with the man-headed Imsety, the baboon-headed Hapi, the jackal-headed Duamutef and the falcon-headed Qebehsenuef. The Ancient Egyptians believed that as the body was incomplete without the liver, lungs, stomach and intestines they were always placed and stored together in the Canopic chests or boxes. The canopic chests started as simple boxes and became more and more elaborate. The oldest canopic chest ever found belonged to Hetepheres, the mother of the Pharaoh Cheops (aka Khufu). Khufu (Greek Cheops) 2589 - 2566BC erected the Great Pyramid of Giza. The canopic chest of Heterpheres therefore dates back to the 4th Dynasty of the Old Kingdom. The simple canopic chests with flat or vaulted lids began to imitate shrines. In the period of the New Kingdom the four goddesses of protection are depicted with outstretched wings on the corners of the canopic chests. The same guardian goddesses are also found on the corners of the Ancient Egyptian sarcophagus. 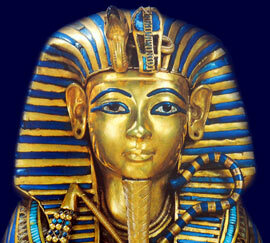 The Egyptian mummification process lasted for a period of 70 days. The seventy day period corresponded to the length of time during which Sirius, the 'Dog Star', appeared to die by dipping below the horizon. Osiris and his wife Isis have both been closely associated with this star. However, Canopus is the second brightest star in the Egyptian sky and according to Plutarch, Canopus is linked with the god of the dead, Osiris. In Greek the word Canopus means "eye of the dog" implying a relationship with Sirius, the Dog star. Could this confusion have led to the god Osiris being wrongly associated with Sirius when he should have been associated with Canopus?